Lots of quiet time for you to paint as you wish, free of distractions & worries, supported with some one-to-one individual tuition. Structured lessons in the morning where the tutor teaches the skills of painting. Opt in or opt out as you wish, you paint at your own rhythm. The tempo is adapted to your needs. Quiet, uninterrupted creative times …. not being called out by a person on business from Porlock. Is The Art Course Right for Me? The course is absolutely fine for absolute beginners. Just bring along your desire to learn, your paints & your holiday spirit, that’s all. We understand that you might be feeling apprehensive, but why not come & give it a try… pourquoi pas? Two ‘absolute beginner level’ watercolours at the end of a weeks course. I so enjoyed your enthusiastic introduction to painting. I have since joined an art class & been painting on a holiday at my cousin’s holiday home. Really loving this new found pleasure – Thank you! – Helen, Scotland. Do not wait until the conditions are perfect to begin. Beginning makes the conditions perfect. – Alan Cohen. Matisse on Beginner’s Mind : The effort to see things without distortion demands a kind of courage; and this courage is essential to the artist, who has to look at everything as though he were seeing it for the first time. 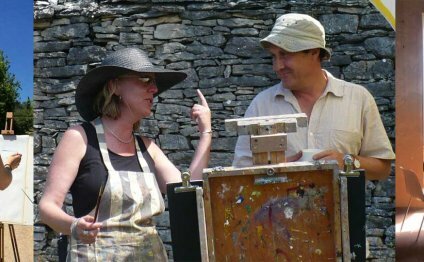 Paint intensely either ‘en plein-air’ or inside the chateau or studio. Have uncluttered time to focus on your own personal practice. Be given help & suggestions with the practicalities & techniques. Dialogue with a practicing mid-career painter, who will encourage the development of your personal style. Making your next step can be difficult without support. When artists work in different places & contexts, a new flourish of creativity often follows as a response to this new input. The workshop hopes to give you this extra boost. During the course we offer the possibility to visit a Prehistoric Painted Cave. To see these sanctuaries is a moving experience for artists. It will enlarge your understanding of ‘art’ & humanity. Adam will give a presentation on Prehistoric Art & Origins. L’Art des Cavernes est l’enfance de l’art et non pas l’art de l’enfance. – Leroi–Gourhan. Mural Artist. Painting of a mural in the South of France.